Bard Games released a trio of accessory books intended to broaden the field of character classes for AD&D. They were moderately successful in their time, and hold semi-legendary status today. 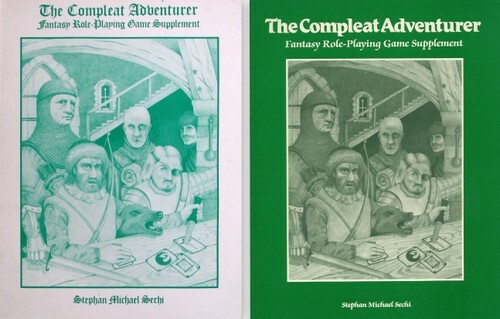 Since each was reprinted in a second edition later in the 80's, the Compleat series is relatively easy to find. 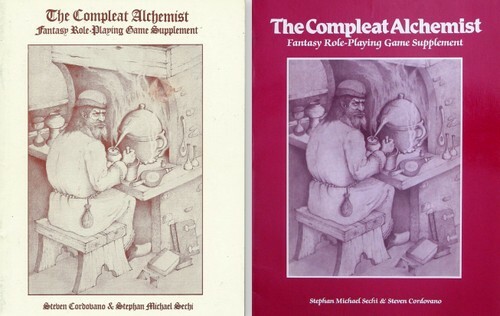 An entire book is devoted to the Alchemist character class. "Essential rules for the Alchemist as a Player or Non-Player Character. Adaptable to most fantasy Role-Playing Games. * Compleat formulae for the creation of Elixirs, Toxic Powders, Compounds, Devices, Talismans, Potions, Dusts, Solvents, Gasses, Essences, Magic Items, and more..."
This book details a few specialized character classes regarding magic use (witches, necromancers, etc. ), a few magical items, familiars, summoning and demons. There are no dates in the Green-covered printing whatsoever. However, they're advertising the 3 Atlantis books in the back, which came out in 1985, 1985, and 1986. So 1985 seems a solid date to apply to the Green book. "THE COMPLEAT ADVENTURER is BARD GAMES' third Fantasy Role Playing Supplement, and covers in detail a host of new character classes that may be added to your favorite F.R.P. game system. 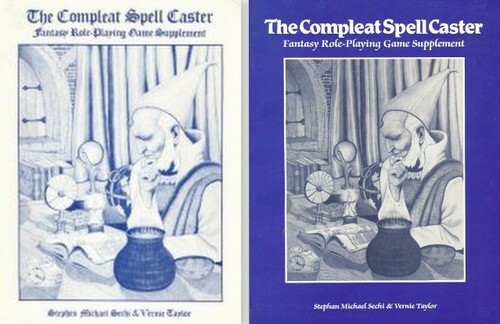 As a logical suc cessor to THE COMPLEAT ALCHEMIST and THE COMPLEAT SPELLCASTER, this supplement is intended to expand the options of experienced players and Game Judges. For the role-player in particular, THE COMPLEAT ADVENTURER offers a variety of colorful and viable types from which to chose. Several of the characters were invested with verbal talents which may be used to great advantage by the clever role-player. To add variety, certain character classes were designed so that the player could choose between several abili ties, thus creating a more "personalized" type of character. Others were given abilities of a highly specialized nature, in the hope that players would more easily be able to relate to (and role-play) them. For the Game Judge, THE COMPLEAT ADVENTURER should do much to add to his or her repertoire of N.P.C. villains, heroes and anti--heroes, while hope fully stimulating a few new scenario ideas. The many new character classes should also add variety to city, village, and wilderness encounters, and make the Game Judge's job a bit more interesting. The character types available are: Beastmaster, Buccaneer, Gladiator, Harlequin, Hunter, Scout, Bounty Hunter, Witch Hunter, Knight, Martial Artist, Rogue, Spy, Swordsman, Warrior"